Details about UN Sc 1/113, C1-C7 MNH. 1951-62 issues, 89 diff, mostly complete sets, VF. UN Sc 1/113, C1-C7 MNH. 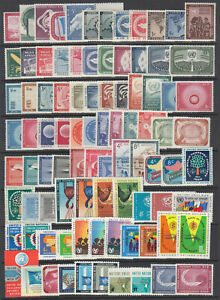 1951-62 issues, 89 diff, mostly complete sets, VF. WE COMBINE SHIPPING - PAY ONLY ONE LOW SHIPPING CHARGE PER ORDER.